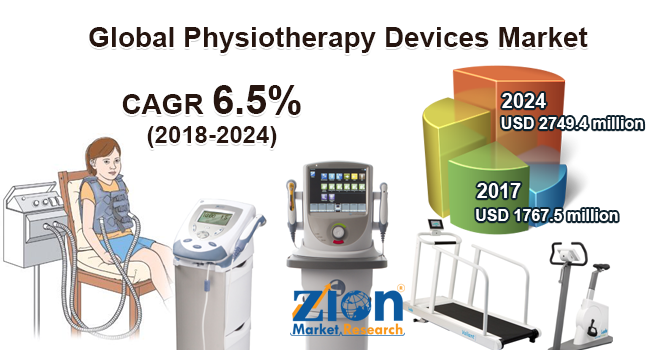 Zion Market Research has published a new report titled “Physiotherapy Devices Market by Product (Equipment and Accessories), by Application (Musculoskeletal, Neurology, Cardiovascular, and Others) and by End-User (Hospitals, Physiotherapy Clinic, Rehabilitation Center, and Others): Global Industry Perspective, Comprehensive Analysis and Forecast, 2017 - 2024”. According to the report, global physiotherapy devices market was valued at approximately USD 1767.5 million in 2017 and is expected to generate revenue of around USD 2749.4 million by end of 2024, growing at a CAGR of around 6.5% between 2018 and 2024. Physiotherapy is a physical treatment provided to people and patients to build up, restore, maintain and continue the maximum movement, flexibility and functioning ability during their lifespan. Physiotherapies are the services provided in the conditions where the functional movement of the body is threatened by injury, aging, pain, diseases, disability, and environmental factors. Increasing prevalence of neurological and cardiovascular diseases globally will significantly stimulate the growth of physiotherapy devices market throughout the forecast period. Moreover increasing road accidents, injury cases, and rising geriatric population will fuel the demand for physiotherapy devices market globally. The physiotherapy devices market based on product category is segmented into equipment and accessories. Among which the equipment segment contribute for the largest market share owing to raising awareness about clinical benefits associated with physiotherapy treatment. Moreover increasing penetration of physiotherapy services and rapid adoption of physiotherapy devices by health practitioners due to ease of accessibility and use will propel the market growth during the forecast period. The equipment segment is further sub-segmented into hydrotherapy, electrotherapy, heat therapy, cryotherapy, ultrasound, continuous passive motion (CPM), laser therapy, and others. The accessories segment is bifurcated into orthoses and assistive devices in the global physiotherapy devices market. Based on applications, the physiotherapy devices market is segmented into musculoskeletal, neurology, cardiovascular, and others. The neurology market is anticipated to value at highest market share in global physiotherapy devices market, owing to rising prevalence of neurological disorders and injuries coupled with long-time treatments. Followed by neurology, the musculoskeletal and cardiovascular segments are expected to grow at the highest CAGR owing to rising preference for physiotherapy for musculoskeletal problems and affordable cost of therapy will significantly boost the market growth over the forecast period. Based on end-user, the market for physiotherapy devices market is segmented into hospitals, physiotherapy clinic, rehabilitation center, and others. Hospitals segment is anticipated to grow at a faster rate due to the enhanced utilization of physiotherapy applications in order to deliver reasonable and early care to the patients. Whereas, the increasing number of injuries and preference for physiotherapy clinic owing to affordable cost will boost the segment growth over the forecast period. Regionally North America, Latin America, Europe, Asia Pacific, and the Middle East & Africa are the major five regions in which the global physiotherapy devices market is segmented. Among which, North America accounted for the highest share in the global physiotherapy devices market in 2017 and is expected to remain dominant over the coming years. The European Physiotherapy Devices Market is anticipated to gain a significant revenue share in the forecast period. Asia Pacific region is expected to record the highest CAGR owing to the increasing prevalence of neurological disabilities among the population, increasing awareness about physiotherapy treatment, and demand for better healthcare facilities is impacting the market for the physiotherapy devices market in this region. Some of the key players in physiotherapy devices market include Patterson Medical, Zynex Medical Inc., BTL Industries, Dynatronics Corporation, Life Care Systems, A. Alego Limited, DJO Global, EMS Physio Ltd., Enraf-Nonius, HMS Medicals Systems, and others.